Or, maybe you’re not headed back to school. Perhaps you want a regimen refresh because the summer-to-fall weather transition is throwing your complexion for a loop. Whatever it is, troubled skin deserves a clear start. MAKE SURE YOU’RE CLEANSING TWICE DAILY. Don’t underestimate the power of the right face wash. Acne Facial Cleanser is a must for congested or problem skin: Formulated with Salicylic Acid to deep-clean pores and break down the oil and dead skin cells known to cause breakouts, this daily cleanser leaves skin thoroughly cleansed—but never tight or dry. Did you know? Acne Facial Cleanser also contains Thyme Extract, which boasts clarifying properties that that give breakouts the (botanical!) boot. In fact, toner can be a game-changer—especially when you’re looking for that extra something to take your skin care regimen to the next level. Not only are Mario Badescu toners crucial for re-balancing skin post-cleanse, but are also specially formulated to deliver additional benefits in a single sweep. For oily, congested complexions, toning is the step that can truly make a difference in how your skin looks and feels. Special Cucumber Lotion is the standard go-to for troubled skin since it offers enhanced cleansing and a cooling, Cucumber boost. If, however, you’re experiencing severe breakouts, try Special Cleansing Lotion”C.” This is a powerful clarifying astringent formulated with Sulfur, Cucumber to target problem areas while removing pore-clogging oil and impurities from the skin. Body breakouts are normal, too—especially during and at the tail end of summer. After showering (A.H.A. Botanical Body Soap is a favorite for keeping skin looking even and clear! ), apply Special Cleansing Lotion “O” to your back and chest. Keep in mind that this is a strong formulation specially designed for use on those areas only, so bare mind that it’s not meant for use on the face. MASK LIKE YOU MEAN IT. Masks are a surefire way to help keep your complexion in tip-top condition and bring a little bit of instant gratification to your skin care regimen. Drying Mask is highly effective at working to clarify problem areas and dry up existing blemishes. To help rehydrate and restore balance to your skin, use Healing & Soothing Mask the day after. …because picking the right one makes all the difference. Whiteheads? Use Drying Lotion. Don’t shake the bottle: just dip a cotton swab straight down the bottle until you reach the pink sediment and apply directly on whiteheads. Small bumps and pimples? Try Drying Cream. Use clean fingers to blend the product onto erupted areas. Less is more with this one! Large, often painful, under-the-surface bumps? Use Buffering Lotion. This liquid-y solution is something you do shake! Shake the bottle until the white sediment is dissolved into the clear liquid, then apply a drop t a clean fingertip and gently pat onto the deep, painful blemish. Experiencing a combination of breakout types? No worries—grab our Acne Repair Kit, which includes all three of our spot treatments. Encourages a clearer, healthier complexion. Simply dust the powder directly on your skin (including your back and chest) where needed, or mix a small amount into your favorite loose powder to add a skin care element to your makeup. Customizing your skin care regimen is key to finding the best mix of products that work well for your skin—but if you’re feeling a bit overwhelmed at this point, no worries. Start with the Acne Control Kit, then add more products as you figure out what your skin needs (and loves!) along the way. Not acne-prone? 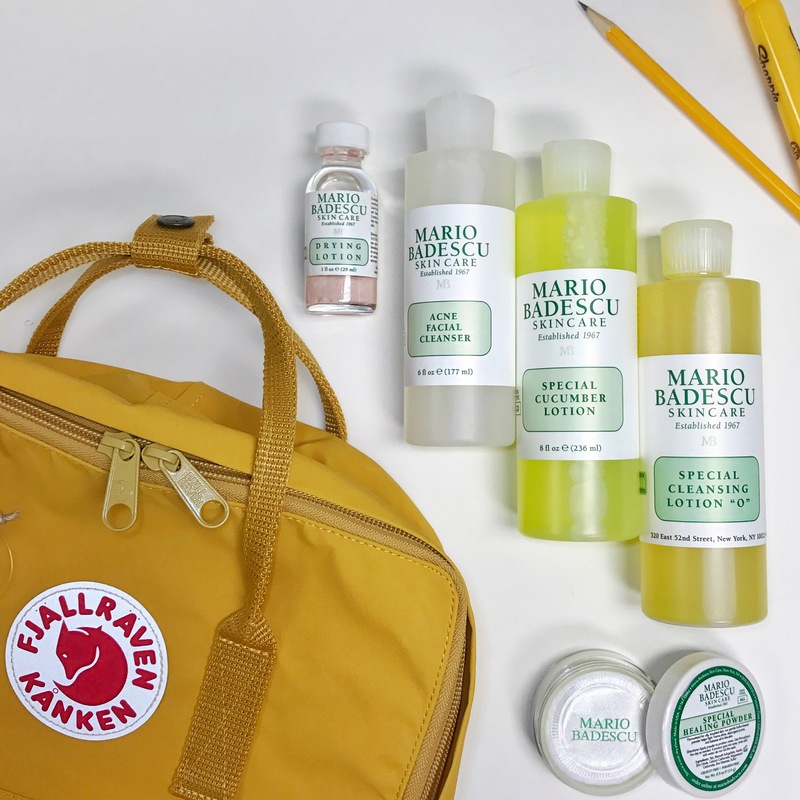 This back-to-school skin care guide was made for you.